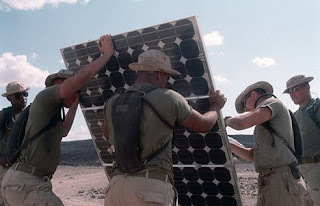 So while Congress is arguing over an RES bill that will do little to bring clean energy technologies to market and tax credits -- which while meager, are necessary for fostering innovation -- the military will be aggressively pursuing renewable technologies. This ambitious stance on energy stems from the 2007 Defense Reauthorization Act, which set a goal to produce or procure renewable energy equivalent to 25% of the department’s total energy use by 2025. The resulting efforts have shown substantial decreases in cost as well as vulnerabilities. If the military throws its full weight behind developing clean energy technologies the potential benefits to our armed forces and our nation as a whole are huge, suggests a recent report by CNA. Throughout U.S. history, and especially after WWII, the military has driven technological innovation through its unmatched efforts and abilities in R&D and directed procurement. When a technology has been necessary for national security, the DoD has spared no expense in acquiring it. The technologies that have followed from defense priorities, moreover, have regularly spilled over into the civilian market, creating whole industrial sectors—aerospace, micro-computing, mass communications—that have powered the American economy for decades. At many of the most vulnerable junctures in U.S. economic history, defense priorities aligned with the needs of the domestic civilian market and allowed the DoD to catalyze rapid technological change that enhanced U.S. security and economic health. The huge amount of consumption on the part of the military doesn’t just mean there are a lot of cuts to be made, but that there is a huge market that could pull renewable technologies to market. It is largely because of the DoD that personal computers can be purchased for under a thousand dollars rather than upwards of ten thousand. Between 1955 and 1958 the federal government, led by the DoD, purchased between 36 and 39 percent of semiconductors produced in the U.S. and that figure shot up to between 45 and 48 percent in 1959-1960. A robust and stable market for semiconductor technologies, provided by the military and NASA’s ‘Buy American’ policies, allowed producers to scale productions and thus drive down costs. In the same way, the military today could drive down the cost curve on solar panels, bio-fuels, batteries, small modular nuclear reactors, and a number of other clean energy technologies. So at this crucial moment, while America continues to fall behind in the global clean energy race and while Congress continues to sit on the sidelines, it may have to be the military that leads the way. This will mean both increased investments in deployment and procurement as well as early and applied R&D. The American military will have to leverage its incomparable assets to do what it has done many times before, simultaneously pushing and pulling cutting edge technologies to market. We must fully realize that our energy policy is our national security policy and our ‘military industrial complex’ could be our ‘green industrial complex’. portlandjiffylube.com is started by Allan and Jamie.they are part of portland oil for over 20 years.They currently own and operate 12 Jiffy Lube locations in the Portland Metro area, including, Sandy and Newberg. they are specialized in portland oil change, portland oil ,portland transmission,portland ac,portland radiator,portland auto ac.